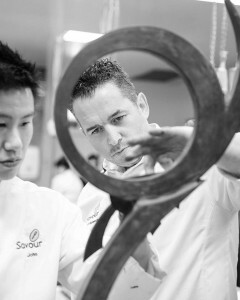 Paul Kennedy is the Executive Pastry Chef of Savour Chocolate & Patisserie School, teaching thousands of aspiring pastry chefs from all corners of the globe who visit the school. He also has experience competing in patisserie competitions around the world, including the World Chocolate Masters. We are very fortunate to have Paul take time out of his very busy schedule to be a guest judge at Savour Patissier of the Year and answer some questions. I’ve been working at the school for over 10 years so when the concept of this competition came about i expressed an interest in being involved any way I could. I was a judge last year and it was an amazing experience from both a judging point of view and being among that calibre of pastry chef (judges) was truly humbling. The pastry industry in Australia has had an incredible transformation over the last ten years or so. We have some amazing Pastry chefs here and some very good Patisseries. I have to say i love eclairs, i love the simplicity of an eclair. When done right they can be amazing. Obiviously the visual aspect of each pastry is very important But my advice to the competitors is to stick to the brief. Don’t over complicate it. Let your products speak for themselves. I am looking to meeting the other judges (Antonio Bachour I already know). But I follow them on Instagram and I’m in awe of their work. This entry was tagged antonio bachour, become a pastry chef, best pastry chef in the world, best pastry chefs, eclairs, entremets, pastry chef, pastry chef courses, patisserie, paul kennedy, paul kennedy chef, savour patissier of the year, savour school. Bookmark the permalink.